... why do keeping luring me back! It's been three years now since I first set foot on the mountain, and I'm heading back for my third season and my 5th, 6th and possibly 7th twenty-day climbing permit. To say that Aconcagua has been a formative mountain for me would be an understatement. Stoked at the summit in 2014, my first time. I lost 16lbs in 16 days during that particular climb. But the story of "why Aconcagua" is for another time. Right now I'm mainly just stoked to finish my 42 hour transit from Potrero Chico to Mendoza (which began at 1:30am on Christmas Day...), stop dragging around 190lbs of group and personal expedition gear - I'm traveling light this year - and say hello to the most excellent team that I'll be spending the next three weeks with: Bobby, Jennifer, and Kristin. It's a co-ed team this year, though Bobby is outnumbered 4:1 by the girls if you include our last-minute addition and volunteer team medic Libby in the count. I'll once again be sharing stories and pictures from the team and the expedition as we're kicking things off in Mendoza and also from the trail, connectivity permitting. As always you'll be able to find more frequent updates on Instagram and monitor our progress on the mountain via my trusty DeLorme GPS. 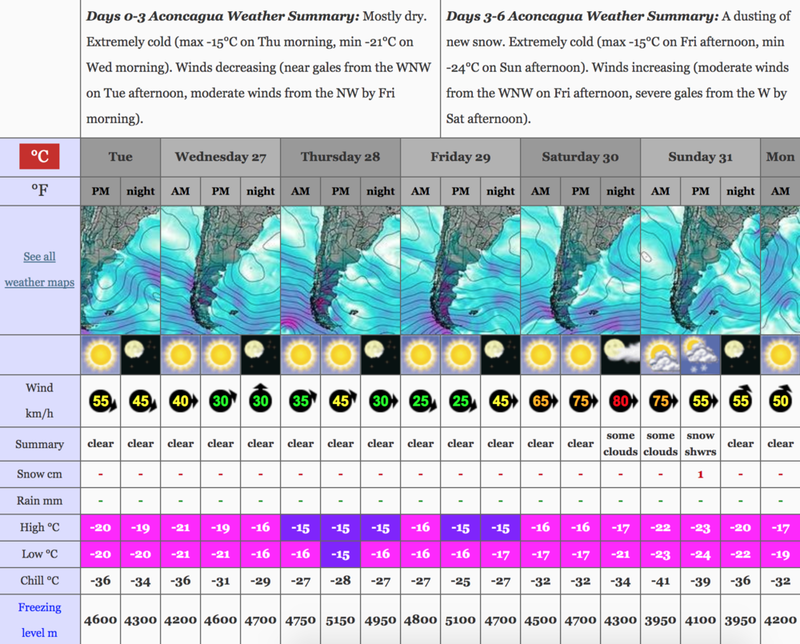 Yes, wind chill in the negative twenties is considered pretty prime on Aconcagua. And so it starts again. Except for a storm rolling through when we plan to hit the trail on Friday/Saturday the weather is looking pretty excellent so far, the route is dry, I'm psyched to see what surprises this season holds for me, the team, and the ever-inspiring Libby (yes there'll be some ambitious speed scheming again after the team expedition is complete.). Thanks for coming along for the journey, and if you'd like to get blog updates delivered to your inbox there's a subscribe option, too. Aconcagua is the perfect high altitude mountain for all sorts of shenanigans, because it has something for everyone: the South Face is among the biggest walls in the world, with some 9000ft of highly technical climbing; the Polish Glacier on the east side of the mountain offers a moderate technical option. And then there's the Normal Route leading up the northwest ridge. The Normal Route is mostly a walkup; there are no glaciers or major cliff bands that could pose serious objective hazards. It is also the most popular way up the mountain; Plaza de Mulas at its foot is rumored to be the second largest basecamp in the world, and from there a well-worn track leads most of the way to the summit. Now... that's not to say that getting up the mountain via the Normal Route is easy. No matter how non-technical it may be, the route still gains almost 4000 meters / 13,000ft from the park entrance to the summit. 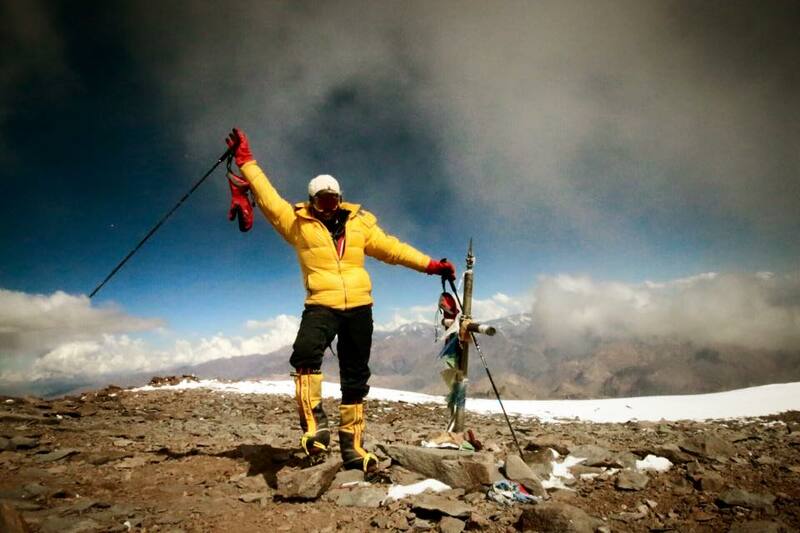 It is long, it is steep, and the conditions above basecamp are often brutal. How long and steep, you ask? Great question - it’s not that simple. Interviews with Fernanda Maciel, the current women's speed record holder, suggest that the entire route is somewhere between 40 and 45 kilometers in length one way. Kilian Jornet, who briefly held the men's speed record in 2014, recorded a distance of 59.85km for the roundtrip or just under 30km one way. My own GPS data from a 2014 climb comes in at right around 34kms one way. So much for the distance question. But how steep? This one is easier to answer: at first not very steep at all; then, very steep. The approach to basecamp follows the Horcones Valley which ascends so gradually that it is almost imperceptible for a good portion of the hike. But the story changes drastically after Plaza de Mulas: the final 10 kilometers from basecamp to the summit cover almost 2,700m of elevation gain, translating into an average gradient of 26-27%. There are five camps in between the park entrance and the summit. The first two, Confluencia and Plaza de Mulas, offer relative luxury thanks to local logistics providers: Inka Expediciones and a few others maintain semi-permanent tents to provide meals and bunk beds for their clients. In addition, there is ample mule traffic all the way up to Plaza de Mulas which makes it easy to move loads up to basecamp. Once past Plaza de Mulas everything gets harder: the air is thinner, the temperatures colder, the comfortable logistics support a distant memory (unless you’re hiring expensive porters to help carry gear as high as Nido de Condores). Put all those factors together with the increased steepness, and you’ll easily see why the 25km to Plaza de Mulas is typically done in only three days, while it’s then another ~ ten days to cover the remaining 10 kilometers from Plaza de Mulas to the summit. Aconcagua via the Normal Route is not much of a technical challenge, but (or maybe "because of that") it makes for an excellent introduction to high altitude mountaineering; the Normal Route also lends itself to comparatively safe solo missions. Hopefully these maps are useful for you as you’re following along friends on the mountain or if you are researching your own Aconcagua climb. On that same note here is one last resource: the tentative mountain itinerary for our women’s team climb that starts right after Christmas. The actual schedule is of course dependent on weather and team condition, but this strawman is a pretty good blueprint of how to tackle a 7000 meter peak with solid acclimatization.